These are just some of the words and phrases to describe one of the masterpieces in the anime world. This isn’t a series, however, this is a full-length feature film, but it is one of my favorite works of all time and one of my favorite movies of all time. In fact, this masterpiece also inspired late film critic Roger Ebert to change his views on animation completely. If you guessed that this is a review of Grave of the Fireflies, then you get 1,000 points added to your power level. You’re not going to find demons, special powers, superhuman battles, moe sisters, or anything of that sort here. This is a slice of life anime through and through to its very core. When people hear slice of life, they think of the happy animes about childhood friends going on adventures, shows about cooking, or perhaps playing Shogi. They never really think about the dark side of life when it comes to these shows and Grave of the Fireflies is one of those films that dares to delve into the dark side of life and do so masterfully. The setting takes place at the tail end of World War II. We’ve seen a few war movies about the Japanese involvement in World War II like Pearl Harbor and Tora! Tora! Tora!, but often times we wonder what happened on the opposite side of the spectrum when America retaliated against the Japanese. 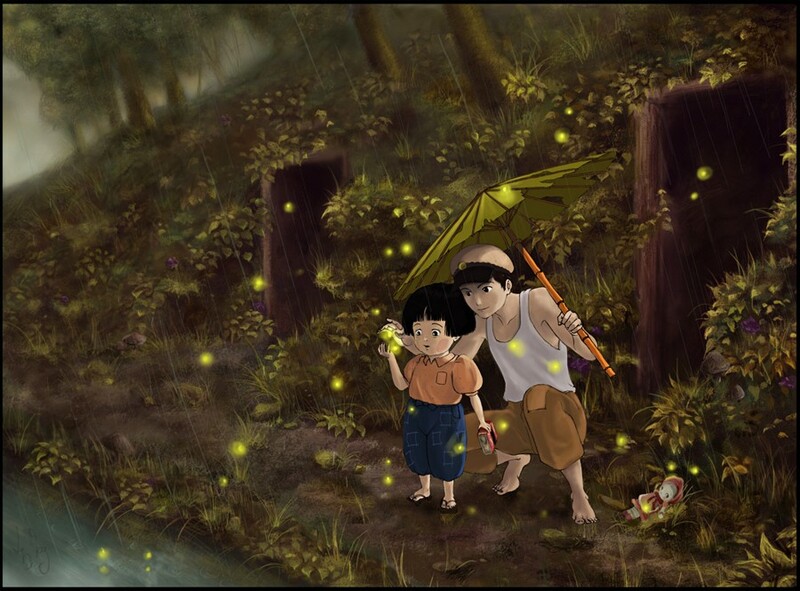 That is what Grave of the Fireflies depicts. There are no heroes or villains in this movie, per se, however, the acts of its main character, Seita, could be considered heroic by some. 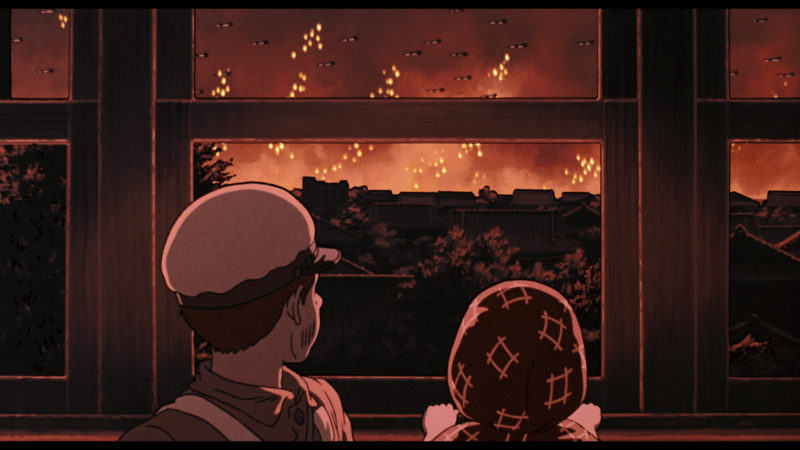 Seita takes his little sister Setsuko with them after their town is bombed and destroyed. They search for their mother who is nowhere to be seen after the bombing, only to discover her at one of the shelters and fatally wounded. They are then sent to live with their Aunt who looks down on them for being lazy while they, themselves, are trying to live it up at their expense. Sick of that kind of treatment, Seita takes Setsuko with him and they escape to a hallowed out portion of a hill by a river, presumably used as a bomb shelter where they try to live on their own in a war-torn country. That’s about as far as I’ll go in case you haven’t seen the movie. 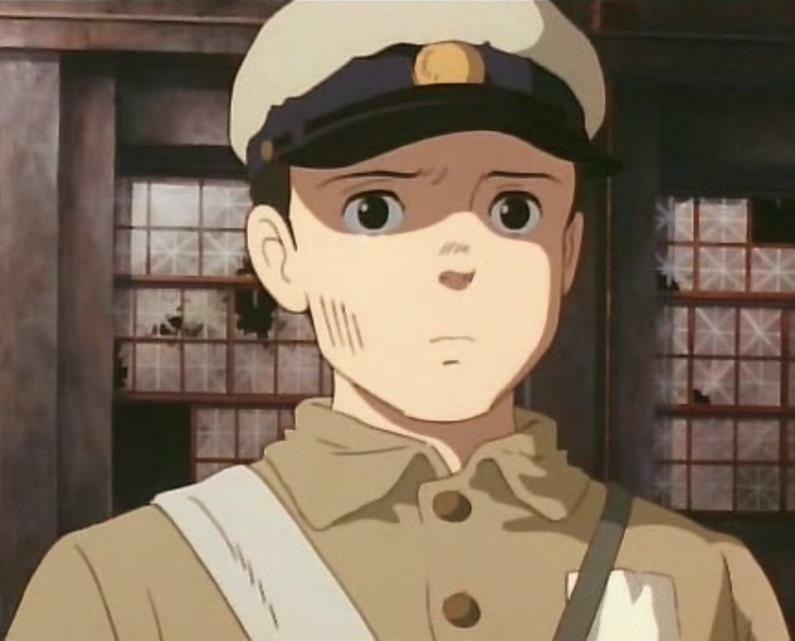 In today’s age of anime, most, if not all shows, will get chastised if the main characters were the focus and all the supporting characters had little to no backstory and/or development, however, with a film like Grave of the Fireflies, if you were to flesh out every character, it would be a complete and total waste and the film would not be as impactful as it was. The focus is on the two characters Seita and Setsuko and nobody else and that is how it should be because this is their story, afterall. In fact, Im going to do something I really haven’t done in a review thus far.. and that’s cop out and copy the character descriptions from www.myanimelist.com. I want to make a point that this isn’t out of laziness, but rather because if I were to try and talk about these characters, it would end up ruining the movie completely for those who haven’t seen it and their character descriptions are the most non-spoiler-ish ones I’ve seen so they work rather well. Seita – A 14-year-old boy. Seita is responsible, mature, and tough. Since his dad is away fighting in the war, he is responsible for all the jobs his father would normally take, including caring for his younger sister, Setsuko. Seita’s main fault is his pride, which can cause him to make wrong decisions. Setsuko – A 4-year-old girl. Setsuko completely adores her older brother Seita. She is innocent and cheerful, and at times naïve to the terrors of war around her. The characters are the really big selling point for this movie, however. Watching them deal with the trials and tribulations of war brings a sense of reality to the viewer and puts a lot of things into perspective. It’s one of those situations where watching Seita and Setsuko, you somehow begin to believe that your life isn’t so bad after all and things could be MUCH worse. The emotion these characters bring are unparalleled. While Setsuko is only four years old, Ayano Shiraishi nails her perfectly and really immerses you into a child’s innocence. It’s through this skillful interpretation that you feel a warm and overwhelming connection to the character which makes it all more impactful given the world these characters are depicted in. Seita was also well-done as Tsutomu Tatsumi brought to life the mentally tough older brother character and developed it very well. This movie looks dated because it IS dated. The movie was released in 1988 so it’s not going to have your fancy CG, your pretty particle effects, and a stellar soundtrack composed of the highest digital quality, but if you’re here to watch it for the fancy artwork, you’re watching it for all of the wrong reasons, but that doesn’t mean the film isn’t believable looking. This film was produced by Studio Ghibli. You might recognize that name because it’s the same studio that made Spirited Away, Howl’s Moving Castle, The Wind Rises, Princess Mononoke, and employs film and animation legend, Hayao Miyazaki. The animation is very smooth and can still hold a candle to CG works that are created today. In fact, I believe that this hand-drawn anime is BETTER animated than a lot of the works that are produced in this day and age and when you have hand drawn stills plugged into a piece of software to help aid in animation, that’s staying a lot. The artwork is very gritty and dingy in the beginning and then almost brings it into a bright and happy medium later on despite the film’s overall tone and intention. It is done this way on purpose to draw you into their reality. It sets the overall tone for the movie and gives you a realistic sense of the world that the characters live in. All of the colorization, the lighting, all the way down to the character designs feel authentic and help immerse you in the world. If there was ever an anime show, a movie/film in general, that you absolutely MUST watch before you leave God’s green Earth, then this is one of those movies. It’s the perfect cure for a self pity party, one of the greatest war movies ever created, and is a movie that will drive anyone to tears no matter how tough you may think you are. The words and phrases I used to open this review haven’t even begun to scratch the surface of how I feel about this movie. To put my thoughts and feelings in writing almost seems impossible because the raw emotion this film brings out is something that has to be felt.. not read. It is a feeling that almost can’t be depicted with words, even though there are so many out there to choose from. When you have a film that can only be described by feelings… be it emotion or something that goes beyond the spoken and written word, you know you have something extremely special on your hands. Grave of the Firelies is available on DVD and a special Director’s Cut came out just a couple of years ago. You should be able to find this for a relatively affordable price on places like Amazon so there is no real excuse to not go and pick this movie up. It deserves to be in everyone’s DVD collection, especially if you’re a big fan of war movies. There are no recommendations because I don’t believe there is anything out there that can compare to this film. So I guess my recommendation here is just go buy and/or watch Grave of the Fireflies. Is Grave of the Fireflies worth your time? YES! When you have a film that can only be described by feelings… be it emotion or something that goes beyond the spoken and written word, you know you have something extremely special on your hands.